After discovering much about the history of Avalon, you're about to discover exactly what lead to the demise of King Arturius and the beginning of Morganthe's downfall. I won't post much of the storyline here because the story is just too fun and interesting for me to want to ruin it for you. 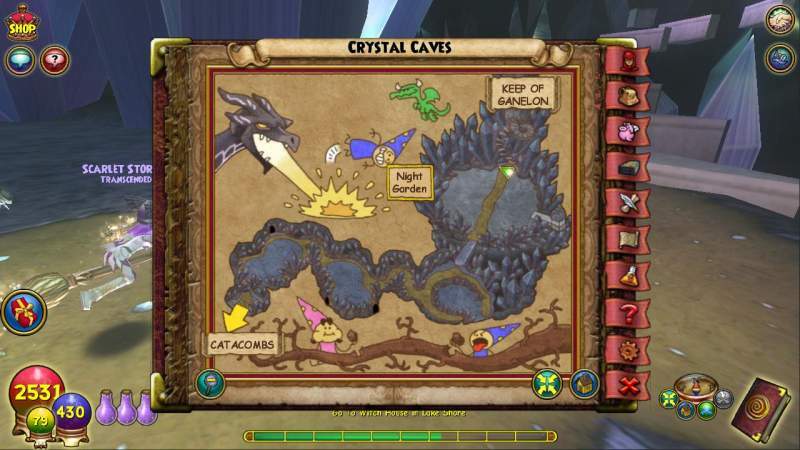 The Mysterious Staircase (leading to Ghost Avalon) is located here, in the Crystal Caves. This is place is a loooong way from Caliburn, so to be safe, mark your location by the sigils before you enter. If you do happen to get defeated, you don't want to face the 5 minute run back before you even get into the dungeon again. if you do have to re-enter, make sure you mark again before you go in. 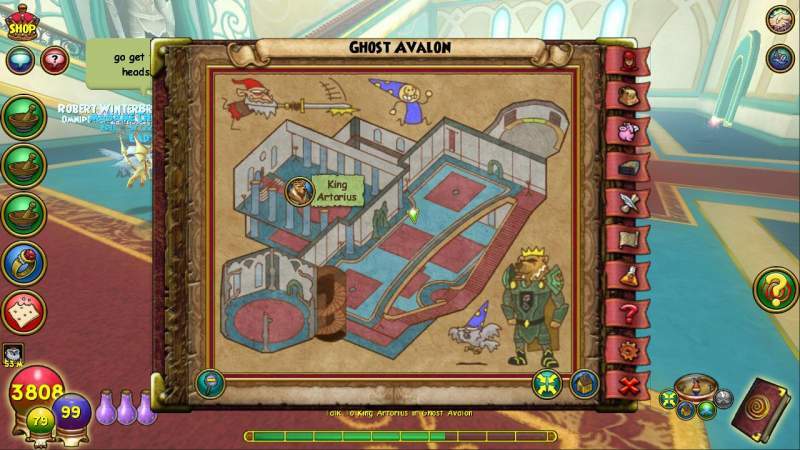 The interior of Ghost Avalon is laid out with many side chambers and stair cases, etc, for bosses to grab their unsuspecting prey. Upon entering the dungeon, you are instructing to fight these Disloyal Knights. I recommend a mad hatter fight here (having all players use two stacking blades, or one blade and an aura, and then hitting with a colossal seven or eight pip attack - life players can use guiding light, mend, and rebirth). After completing this and speaking to the king, you need to clear the way to Young Morganthe by fighting off the UnSung Knight. (There are no cheats in this fight.) The Unsung Knight will respawn as soon as you trigger Morganthe, so you can fight him again later if you wish. At long last you come to the REAL battle - you vs Young Morganthe. She's gone a little too heavy on the hair gel and hasn't yet gone into evil queen mode, but never fear. Underneath that normal(ish) teenage exterior she's still the same old evil cheating Morganthe. 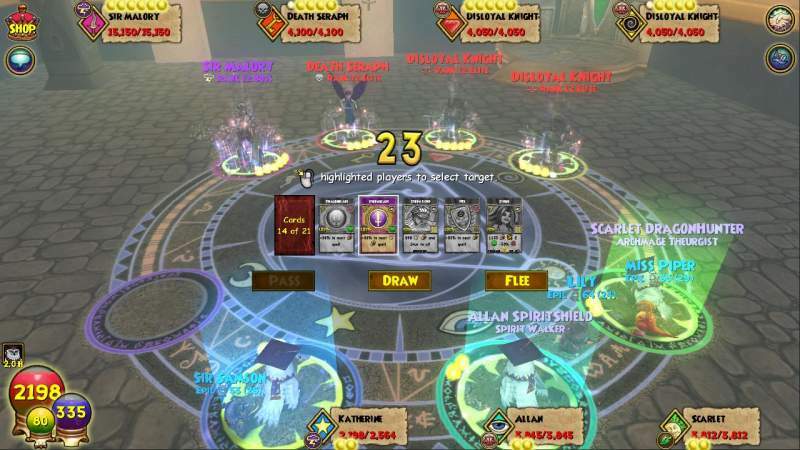 Morganthe's cheats are ALL over the board, but here are some tips that seem to be true in all rounds. -If anyone on your team has 8 or more pips, Morganthe will interrupt and use mana burn on them at the start of the round. HOWEVER, if you've cast a 7 or 8 pip spell that round, it will still cast. If you haven't used up those pips that round... well, I'm afraid they're gone. If more than one member of your team has 8 or more pips, Morganthe will mana burn ONLY the person who has the most pips. If two people share the same number of pips (and both have the most pips on your team), Morganthe will mana burn whoever is first in the battle order. -Shields will always trigger an earthquake followed by a nova. 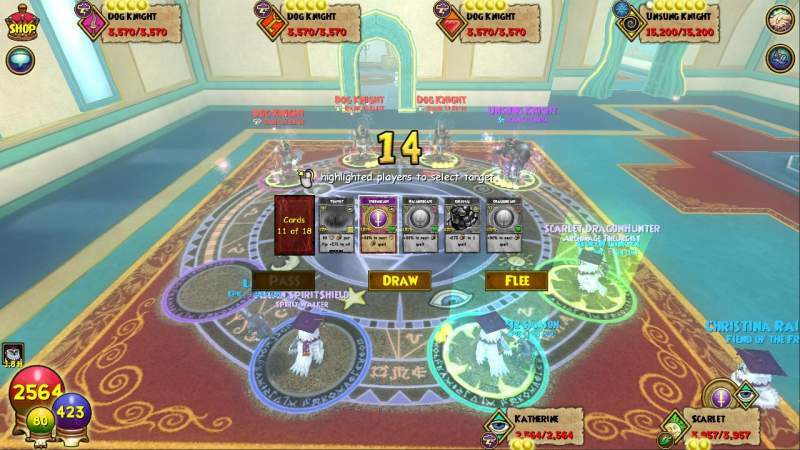 -pet spells (feinting spell, dragonblade, etc) do not trigger any cheats. Aside from these cheats, Morganthe like to shout out "TIME FOR A NEW STRATEGY!" and change things up out of nowhere on occasion. There doesn't seem to be any specific trigger for this, nor do her cheats seem to change drastically when she says this. -Fizzling may result in a mammoth to the person who fizzled. -Healing may result in a mammoth to the person who was healed. -Blading may result in a mammoth, usually to the person with the most pips at the time the blade was placed. -Trapping and prisms may result in an earthquake followed by a power nova. This earthquake will not only hit your team, but will also hit Morganthe. However, when it his Morganthe although it LOOKS like an earthquake hit, it FUNCTIONS as a 100 damage fire hit. It does not remove her blades, it does not use up all traps the traps on her - only the universal traps and fire (no idea why it's a fire hit for her) traps. Remaining traps/prisms will stay on her, as will remaining dispels and blades. -Auras may result in a mammoth. -Hitting without killing may result in a mammoth. While all of these things MAY result in a mammoth, you should note that she rarely reacts to anything but traps/prisms and auras any more, and often not even to those. Because her mammoths have been so nerfed, we nw highly recommend Strategy #3, which involved having everyone put up a melt first round and them simply blading up and spamming low pip colossal attacks. It's a safe, fun stratgy and the melts you put up in the first rounds should last through the whole fight. That being said, there are a lot of ways you can deal with this fight. These are three main ones that I'd consider the safest. The Krag is a pretty much a simple smash & crash strategy. Don't worry about blades and traps since they trigger so many cheats- just use colossal'ed low pip attacks and just hammer away at her. With three or four players who have a decent attack boost, this fight can be over with pretty quickly, although there is definitely some risk here - you're doing nothing to counteract her mammoths. However, your attacks chip away at her pretty quickly, and you will generally wear her down before she manages to take out anyone on your team. The Nergal strategy is a bit more complex. 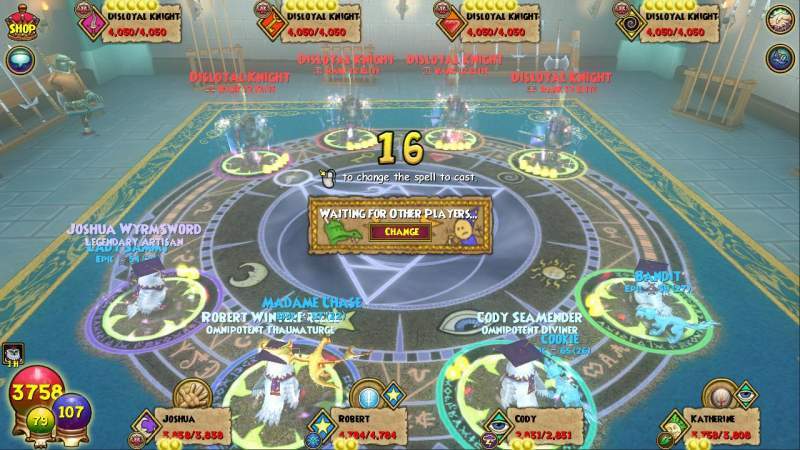 -To begin the fight, every team member will ice dispel Morganthe on the first round. This should negate her mammoth cheats for the fight. Take a round after this to recover your pips. 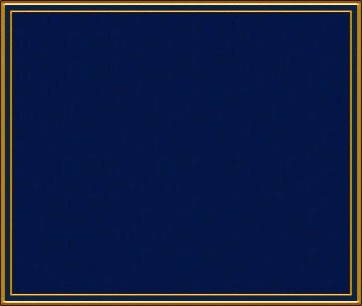 -In turn three, place three vaporize on Morganthe (only two are needed if one of your feints is a pet feint - an extra vaporize is needed if you plan to have a death hammer who will need to prism). In the followingrounds, place your feints and blade your hammer. Note that she may still hit you with nova when you place your feints. This will give your hammer a weakness - this is fine, just add and extra stacking blade to counteract the weakness. You'll want about three feints and four blades to ensure the hit kills. -Once you have all three feints and four blades up, your Hammer can hit with a colossal 6 pip attack for a one hit kill. The strategy is our preferred method, and is a middle of the road method between the above. It's straigtforward enough that you can do it with a team you just meet at the sigils, and safe enough that your team should get through with no issues. The only dispel involved is melt, which makes it very simple to find what you need in your sideboard. -On the first turn, everyone should melt to try to get several to stay on her - the more melts you have on her, the safer you are. Once there are a few melts, you can begin to blade and set up for a series of hits. Whenever she starts to run low on melt, your team can simply pull more melt out of thie sideboards and place more on her. The melts will keep your team safe from her mammoths. After you've gotten your melts up first round, take the chance to buff up your attacks a bit, and then hammer away at her with bladed attacks (preferably enchanted with colossal). You'll want to stick with 6 pip attacks or less due to the mana burn issue. 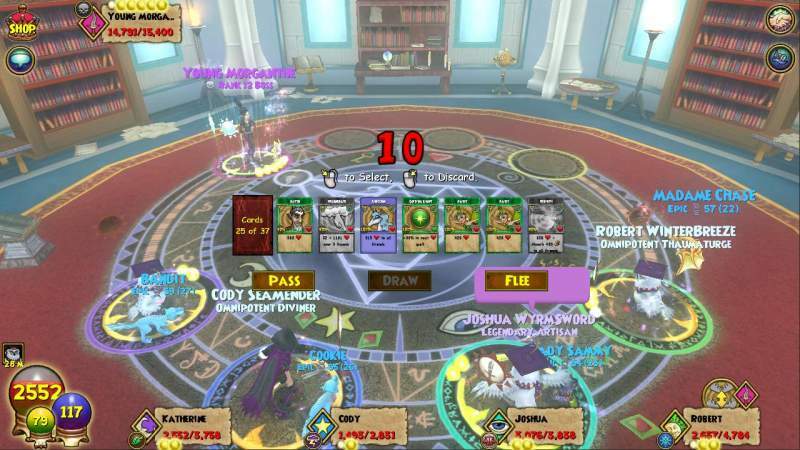 As always, pet spells are excellent for helping to set up a big hit safely. Once you use dispels to take her mammoths out of the equation, you'll find that she's not such a scary boss after all. The video below illustrates the Krag-ish Nergal - if you watch closely, you'll notice heavy use of pet spells to buff up for an initial big hit. After you defeat Morganthe, she is taken to task and has to face the consequences of her actions... which of course means you have to be the one to do another battle. (Sir Mallory has no cheats, just a major attitude problem.) After you've completed this fight, Morganthe will respawn, so if you'd like to farm her for something you can head back in and take her on one more time. After you defeat Sir Mallory you receive some very nice looking badges and titles and are left to wonder... if Morganthe was like this at 17, what on EARTH is coming next?! If you've experienced something different or new in here that doesn't match up, or have a theory about her cheats, let me know! We're still trying to hammer this out so I could very well be wrong, or KI could decide to change the cheats at any time. I am extremely grateful for any insight that others may have into this. As always, if you'd like a hand with this boss, just click on my signature to get to the Mercenaries For Hire forum. Make a request in the Difficult Instances thread and we'd be happy to help you out! *We have been as methodical as humanly possible here and found no pattern at all. Eg, in one round, all player would place storm trap, life trap, death trap, storm trap.... one of those traps sent two mammoths in a row to sun spot. One got a quake and then a nova One got a mammoth on the person to the right of them, THEN a quake, THEN a nova. One trap got no reaction what-soever. We have done similar tests with blades, heals, auras, and across the board, her cheats seem to work this way. It's as though they programmed in all of the cheat boss possibilities and put them on shuffle. **In our first fight, sun spot used a stun block as the first spell of the fight. There was no reaction. In our second fight, sun spot used a stun block as the first spell of the fight. They got a wooly mammoth, a second wooly mammoth, follow by a quake, then a nova, and then a third wooly mammoth, all in a row. All subsequent stun shields earned at least one mammoth or a quake & nova. Last edited by Katherine_Light; 8-6-13 at 10:55:44 PM. Reason: Because of bag of tricks is very different from a bag of ticks, although Morganthe actually might have a bag of ticks, too. Huh, good job on the guide. LOL, my exact words to cody last night when he helped me and alura, "I cant wait to see Katherine make a guide on this!" Its confusing to pinpoint exactly what and what you cannot do at different times. I just wish everyone luck on trying to find her cheats, it seems almost impossible right now. Great guide so far! That instance looks challenging. He told us "She hit me with a wooly mammoth once!" My response then "LOL, that's cute." My response now: "Only once?! TELL ME HOW YOU DID THAT!" To be fair, using the above strategies we only got two extra mammoths (one turn we pushed our luck with the blades, lol) but maaaan. My first time through, when we were trying to discover trigger, we got EIGHT in one round. Last edited by Katherine_Light; 4-12-12 at 11:10:02 PM. All times are GMT -4. The time now is 11:25:49 PM.